An alarm blaring at 3:00 am is not the way I planned on starting my day. A groggy eyed Avery lifted her head and glared at me from the bed over. I laid in my little twin bed, listening closely for movement outside our closed door. If they’re up, we’re going. If not, I’m going back to sleep. The night before, we paid $1.50 to register our car with Haleakala National Park in hopes to wake up early enough to drive 95 minutes to the top of Haleakala Crater to see the sunrise over Maui. While I was not a fan of the 3:00 am wakeup call, the view was worth it. The drive started off like any other drive you would take at 3:30 in the morning: pitch black and every other member of the car sleeping. My poor mother, bless her soul, drove the entire way, while the rest of us passed in and out of sleep. Around 5:00 AM, we made it to the check in point about half way up the crater. We continued to drive up the winding road, easing around hairpin turns while climbing higher and higher.Haleakala is Maui’s highest peak, at a little over 10,000 feet above sea level, and is one of the highest peaks with the shortest ascent in the US. (fun fact!). The winding roads, steep hills, and turns with no guard rails set the stage for the sun breaking upon the horizon. The sun had just began its ascent up, stirring the sleepy-eyed world beneath its shine. Light faintly glowed behind the silhouette of the inactive volcano. The higher we climbed, the lower the temperature dropped, until we reached the top of the summit where it was a whopping 47 degrees farenheit (okay compared to the 80 degree weather we’ve been enjoying, this was cold. especially at 5:30 in the morning). The sight from the summit was breathtaking. I’m not sure any other sunrise will ever compare to what I saw on this lovely June morning-although Rosemary sunsets come pretty close! We were literally above the clouds; the cloud coverage looked dense enough to walk on. Shades of pink and orange and purple twisted through the clouds as the sun peeked out from behind the volcano, lighting up the world with its power. Wind whipped at our hair, our clothes as we gazed in awe as Mother Nature ran her course. It’s amazing what Earth is capable of, and how important it is that we do our best to conserve its natural beauty. Not exposed to pollution along the summit’s high elevation gave way to some of the most magnificent arrays of color I have ever seen. 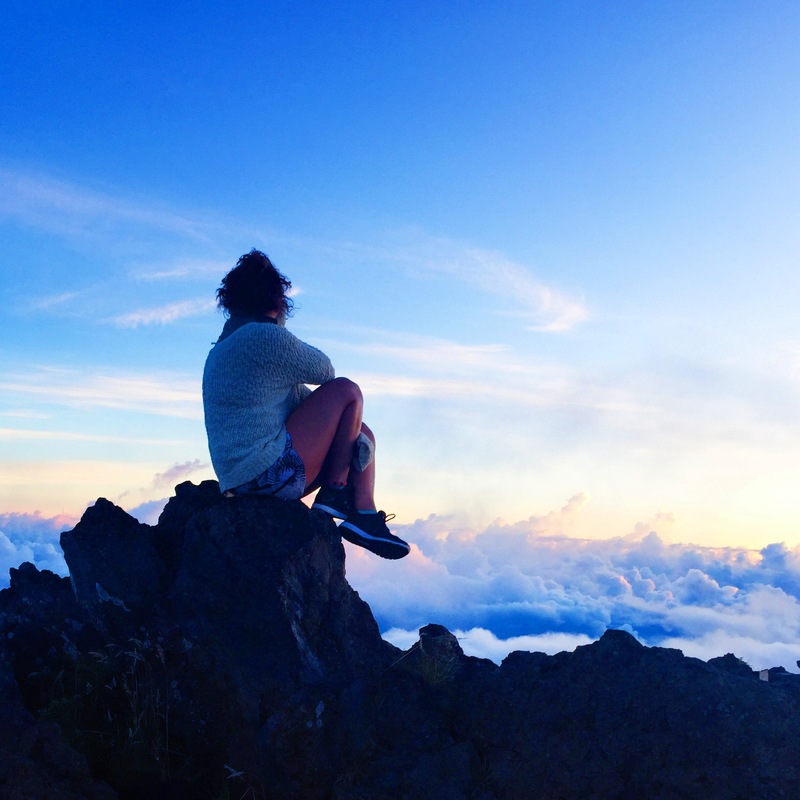 Cotton candy skies from the top of Haleakala! Sunrise or album cover, lmk! As someone who is an early riser, I’ve seen many sunrises and never fail to appreciate the Earth’s beauty when the golden rays break across the sky. But nothing in my entire life prepared me for the ethereal, out-of-this-world visual I was blessed with on Wednesday morning at 5:45 am. Sure it sucked waking up at three am, but the feeling of wind in my hair as I sat on the top of the world-literally-and temporarily lived in the clouds was a feeling that I probably will never experience again in my entire life. It’s amazing how something so much bigger than you can make your problems seem insignificant. With a new day ahead of me and my stressors dissipated by the golden light, I set off down the steep path to my next adventure: finding breakfast. Before breakfast, we took a slight detor in search of the legendary Jaws beach. You know, the beach where they have to pull the surfers out by jet ski because the swells can hit anywhere from 20-70 feet high. So we all know how unreliable Apple maps are (sorry not sorry) so when we were sent down a dirt road lined with overturned cars and washing machines, we were a little concerned we weren’t heading to the right place. In fact, I was convinced I was going to have to say goodbye to my sweet dog Mojo because we weren’t coming back in one piece. When we finally reached a clearing overlooking the magnificent Pacific, we stopped for a breather and then head back on the treacherous path to civilization. The view of massive swells breaking against the cliff walls lined in tall pine trees was incredible, but not what we were looking for. In case you don’t believe how we got there, here’s a narration of my mom’s opinion on our trek. We ended up grabbing breakfast in the lil boho town of Paia-aka Maui’s Hippie Hideout (I was right at home). Honolulu Coffee Co. had a nice little cafe nestled in between the colorful buildings that made up the downtown area. There I was blessed with one of my favorite meals- an acai bowl! Yes, I consider this something I can eat for breakfast, lunch, or dinner. No I’m not a vegan or vegetarian, there just that good. 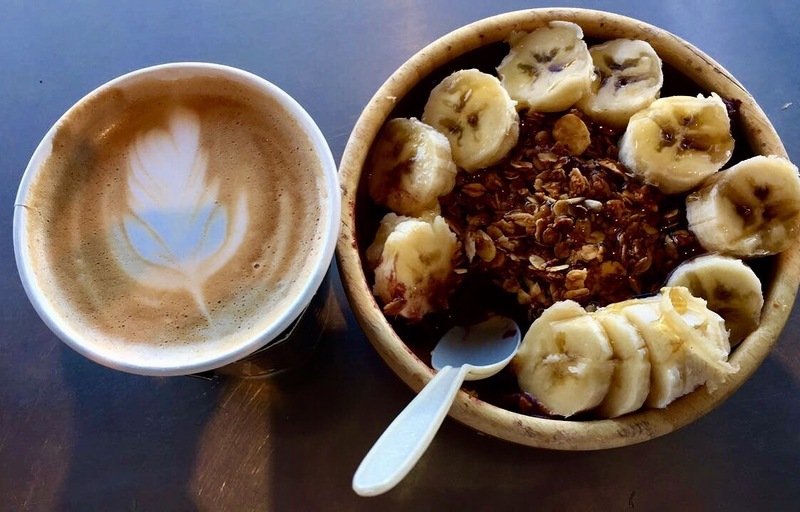 Seriously, what’s not to love about a frozen, sorbet-like blend of superfoods and fresh local juices topped with banana slices, homemade granola, and local honey?? And the Macadamia and coconut milk latte?? To die for. While perched on a stool in front of a window that peered out to the Main Street, I dug into my favorite meal and started thinking about our next adventure. It wasn’t even 9 am!